Is your business facing this problem with its current Web collaboration software? If so, it’s not alone. Research from Ovum shows that 66 percent of buyers are in the market for a new Web collaboration tool. Why are so many organizations unhappy with their current Web collaboration software? According to Ovum, 42 percent of users want a better user experience, 19 percent want reduced license and server costs and 9 percent want better features (like file and screen sharing). The fact is that many Web conferencing solutions—particularly the free ones—are extremely limited in their offerings. Many don’t offer the necessary communications tools for effectively conveying ideas between end users. So, where should you look for answers? Onstream Meetings is a great place to start. 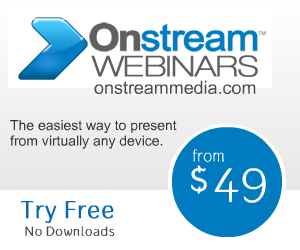 Its browser-based cloud conferencing platform, Onstream Media, combines over 100 features into a user-friendly interface. Using Onstream Media’s all-in-one Web collaboration platform makes it easy for end users to share and edit documents while engaging in crystal-clear audio, text and video chats. It’s a well-rounded platform that will provide your business with all of the tools it needs to facilitate high-quality meetings online. Click here to learn more about how Onstream Meetings can provide your business with a leading Web collaboration tool.